If you are a parent of a daughter in this day and age you will find that this title attracts you. 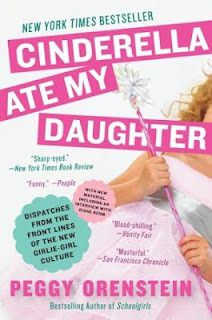 You will find that you are drawn to hear what Peggy Orenstein has to say about little girls and princesses. Yes, most specifically Disney princesses, but she also tackles the whole male and female children story. Story sounds weird, as this is not a novel. Not a story, necessarily. 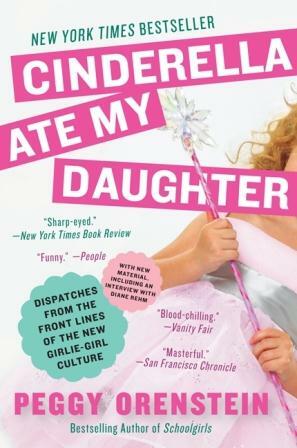 Orenstein touches on Disney princesses, Toddlers and Tiaras and child pagentry, toys for boys and lots more. She asks if pink is the only color your daughter should love, if girls are allowed to play with trucks and whether or not Barbie is outlawed in your home. And if not - what about Bratz dolls? And what about any other hoochie-mama (my wording) like toys that are geared towards girlie play, but a bit beyond, in some ways? As a mom to a 5-year-old girl, I get it. I was one of those moms who reacted to the girl Lego toys recently and asked, "WHY?" - what for? Doesn't your daughter play with the red and blue and green ones the same way my daughter does? The way that someone else's son does? Or is it just me who isn't gender specific when it comes to toys? My niece hit the princess phenomenon when my daughter was still stuck on Dora. Not the new and teenage Dora, but the young, big-headed Dora that we knew and loved - or loved to yell at to lower her voice and stop screaming! But I digress. Back to my niece. They're only 6 weeks apart. Yes, my niece is older, but what's the difference? Did I luck out because I never got overloaded as a mom with the princesses? My niece is on to Barbie now, or she was. And Justin Bieber. My daughter enjoys watching Glee with me, listening to the remakes of the music and also loves watching Bug Wars with her dad (not me, I'm creeped out by bugs! ), and Dirty Jobs with both of us. But who wouldn't enjoy watching Mike Rowe, right? Orenstein touches on so much more about the marketing aspects towards girls and boys, and the way that toys are created, the way that the Princess phenomenon began, and why pink is the be all to end all for girls' toys. I honestly can't review this book to the fullest as to touch on everything she speaks of would take up my entire blog. I haven't looked, but I know she has a website and a blog that is devoted to all of her research and thoughts on this subject. Check them out here. I will wrap up my review and share a memory of one of the lines from this book that has impacted me the most. When discussing the Princesses of Disney, there was a mention of how initially each character was marketed individually. There were no "Princesses" to speak of. Cinderella was Cinderella. Snow White was Snow White. And so on and so forth. And then the marketing mavens hit a stride, found a way to sell them differently. Group the princesses together. And so they did. And things took off! But, and this is the biggest but of all ... check out any princess paraphernalia you have at home. Look at your princesses. They are never, ever (I repeat, ever) looking in the same direction. When Orenstein pointed this out early on in the book, I had to go check. I couldn't think of what my daughter had readily available (she likes them, but we're not overloaded by any means). I remembered her pull out plush sofa bed. Sure enough, there they were, four beautiful princesses. Each looking far off into the distance. Consider this for yourself and tell me if you haven't run off to check something in your own home? You don't have to be a mom or dad to a daughter to appreciate the topics discussed in this book, but I definitely think it helps. You'll see perspectives from people in the business of children's toys, parents of children of all ages, and Orenstein herself. The princess debate will forever continue, I'm sure. But the author here has shared a great insight to it all and given me much food for thought. And then some. Maybe a little pink icing for dessert, too. So go find yourself some and let me know what you think! Great review! No princesses here because my girls are older, but we had our Disney moments. I love the book "Paperbag Princess" for girls. I want them to believe in "happily ever after" but also to realize that they can get there on their own if need be. "But who wouldn't enjoy watching Mike Rowe, right?" Hahaha! You are correct. Interesting about the princesses looking in different directions. I wonder why that is? I'll be reading this book at some point, so I'm sure I'll find out. We were just a Target this week and notice two aisle of all pink toys. JDaniel barely looked down them. They are so girls he pointed out. Great review! I think toys should be for everyone. yeah, hey! Why don't they all look the same way? does the book explain that? Boy's doll-toys all usually stare a hole right through you. They are tough looking.